2 position blade - extended as shown or retracted in 'stubby' mode. Features Rapidaptor bit holder for one-hand bit change, detaches for use with power tools. Multi-component Kraftform handle for comfort during extended use. Push button pop-up bit storage for six 25mm screwdriver bits. Includes PZ1 and 2, PH1 and 2, slotted 5.5 and 6.5mm and rugged pouch with belt loop. Suitable for hand and power use. 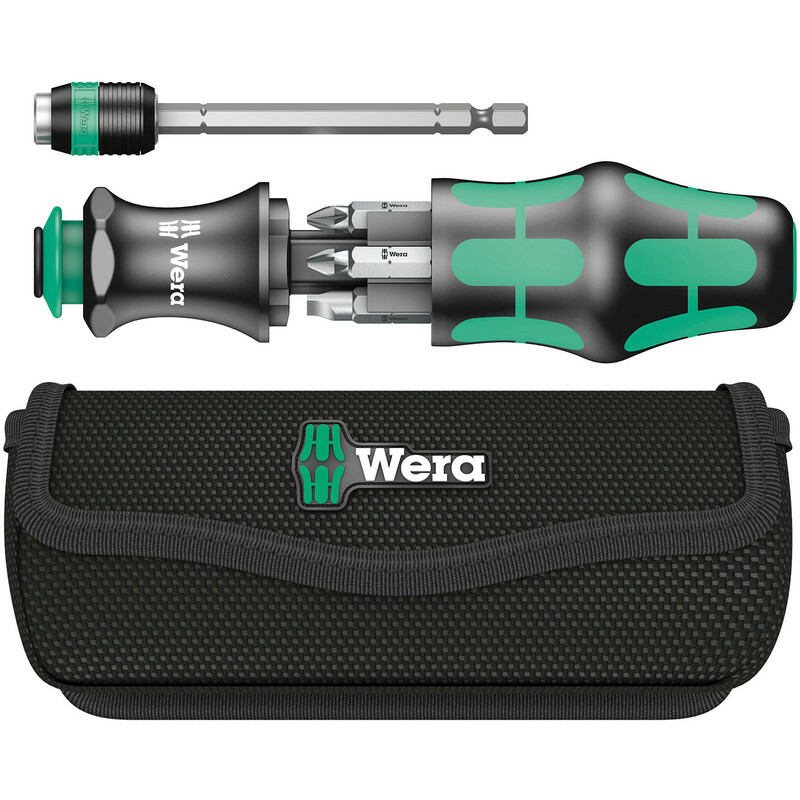 Wera KK20 Multi Function Screwdriver in Pouch is rated 3.5 out of 5 by 6. Rated 1 out of 5 by Paul1944 from Poor functionality Maybe I got an outlier, but this was not up to Wera’s usual good quality. The removal and retraction of the driver shaft was a 2 handed job with a considerable struggle. Toolstation as usual were great and took it back, no quibble. Rated 5 out of 5 by isidore from Quality A delight to use. As with other Wera drivers, the bits are of high quality and the handle is comfortable to grip. It is quite expensive - but Toolstation's price was very competitive. Rated 5 out of 5 by fr g from Worth the money This is fairly expensive, but good value. You always have the most common bits easily to hand, it’s very versatile and comfortable to use. Rated 1 out of 5 by Don ki from Not good Bought to drive nails but didn't work, was ok with screws though, however, don't buy if your left handed. Rated 5 out of 5 by Edddi from Multi-functional Bought this to compact my toolkit. Rated 4 out of 5 by Spider12 from Compact, good quality, useful features. I've had one of these for 4 years. Use it mainly around the house, compact, handy & versatile. Oldest daughter liked its features, so bought her one too.